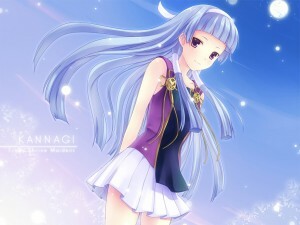 Seconding, Kannagi is out on share! TenB seems to have posted his encodes on nyaa, and there’s often some kind of shimmering during movement (like deinterlace artifacts or low fps artifacts); I don’t know if this is a bad encode or present in the blurays… if it’s the later I hope something can be done about it. Never mind, I’m pretty sure he just screwed up his encodes. There different frame-rate versions of openings and endings, I guess that´s why TenB are screwed his encode. Will CG be using the OP and ED subs from Shin-GX? The KFX look good for them and appear to be reasonably accurate when compared with the DVD versions I have seen. No. Hardsubbed can’t be extracted. Are Coalgirls that incapable of typing them out? Are there any plans for a 1080p release? Thanks, I love this show! The is 11 ordered ED chapters. It’s that way since it made my life easier as I didn’t have to deal with VFR that way. I’m an administrator of an portuguese fansub (from Portugal) and I’d like you to answer some doubts that I have. If you don’t mind, of course. I’m subbing Cardcaptor Sakura and I’ve found the torrents here at your website. I’ve downloaded the first movie but it has 6gb. How can I convert the movie into a smaller size in order to burn to a dvd after doing the subtitles? >>The is 11 ordered ED chapters. It’s that way since it made my life easier as I didn’t have to deal with VFR that way. The BD is 1080i? Interesting. yeah, the bd was 1080i sadly. but with a good YADIF filter it looks pretty good. I’ve set-up MPC the way indicated in the playback section and had no problems playing all the animes CGi has done so far. However, for Kannagi, MPC crashes everytime I open it. Tried also the Play_All but MPC still crashes. Where did I go wrong on this one? Thanks! I had a similar problem where if I fast forwarded at any point, it’d crash. Just go to the mpc website and download the latest version and it’ll correct the problem. You can check the help and about box to see what version you have. I saw I didn’t have the latest version so I upgraded. It worked. I have the latest 1.6.1.4235… Maybe because I use a Windows 8 Storage pool ? I wasn’t getting OP/ED for this release, then I tried to update MPC-HC like in your page and now it crashes in every episode. I can’t found 1.5.3.3819, 1.5.2 yes but I have still the problem. I love you so much that I might just turn lesbian for you. Can someone tell me why the hell the ordered chapters in the ep are fucked up. For some reason the OP won’t play in WMP when watching an ep but it does work when watching the singlet OP file.Weird thing is all does work perfectly in MPC. What can cause this irregularity?~! For those having trouble, try updating whatever video codec you’re using. It kept crashing for me too, so I tried different versions of MPC (both the newest and the one Coalgirl mentioned), but it didn’t make a difference. Updating my codecs did (I had a pretty old version of lav video). The first 2 lines of the OP, after the words “I know it”, are reversed. Just an FYI, not asking you to do anything. Great work on everything else on the BD. Thank you very much. Hi guys! thank you for this release! but am I the only one here having a problem on OP of every episodes? it’s crashing on the OP. I have the latest codecs but i still have this problem. can anyone help me with this? I play my files on my Boxee and I can’t play the 10 bit files yet. I was wondering if there was a way to tell what was encoded in 10 bit and what isn’t.